Sharpening accessories to keep your knives in top notch shape: sharpening stones (whetstones), honing rods, sharpening guide clips and more. You can easily sharpen knives on your own, it just takes a little bit of practice. 2-Step Knife Sharpener. 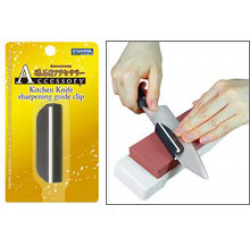 "V" shaped carbide sharpener sets edge. Ceramic rods finish the edge. With n..